We will now turn to the deliberations and decisions within the Cardiff Corporation that resulted in the removal of Temperance Town in 1937. The process seems to have started in 1930, when the Great Western Railway decided to build a larger and more impressive railway station. The GWR were not happy that travellers emerging from the railway station would be presented with a view of several terraces of houses lacking architectural merit and with evidence of the poverty of the people living in them. In addition, at that time the ends of the terraces facing the railway station were adorned with large advertising hoardings. 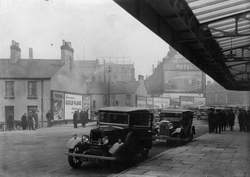 The GWR requested that the Cardiff Corporation should improve the approach to the railway station. The Corporation appears to have been only too willing to comply with this request. In November 1930 the Council created the Station Approach Sub-Committee to take charge of the process of transformation. The Proceedings of Cardiff Council and its subcommittees for 1930 to 1939 can be seen in Cardiff Central Library, bound into heavy annual volumes. As well as the Council itself and the Station Approach Sub-Committee several other committees also played a part in the removal of Temperance Town. They included the Finance Committee, the General Purposes Committee, the Public Works Committee, the Parliamentary Committee, the Housing and Town Planning Committee, and the Transport Committee. The Proceedings of these various committees make surprisingly gripping reading. From the start the Station Approach Sub-Committee began to plan the removal of all buildings south of Wood Street. They were keen to erect an omnibus station on part of this land, and various ideas were floated for the rest of it. In due course it became necessary to establish two further sub-committees. The Negotiating Sub-Committee was given responsibility to negotiate with privately owned bus companies over their use of the omnibus station. The name of the Acquisition of Properties Sub-Committee is self-explanatory. The main scheme that emerged for the space not to be occupied by the bus station was for a public garden with an underground car park beneath it. It was envisaged that the car park would have a mechanised system for lowering and raising vehicles. 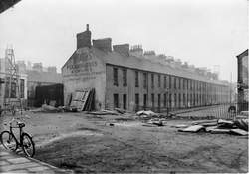 By 1935 Cardiff Council had decided to extend the development project to cover the whole of Temperance Town. 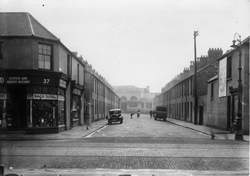 The streets north of Wood Street were brought into the scheme, and in that area it was proposed that two large halls should be built, one as an exhibition hall, the other for conferences and other public uses. The title of the sub-committee managing the project was no longer appropriate, and instead it became the Wood Street Area Improvement Sub-Committee. The Corporation came across unexpected legal difficulties when they began the task of acquiring properties. The Parliamentary Committee had to prepare legislation that would give the Corporation acquisition powers, and to this end the Cardiff Corporation Act 1934 was passed in July that year. About the same time the Corporation felt obliged to take advice from the Ministry of Health. The reason for the involvement of the MoH is not entirely clear from the proceedings of the various committees, but it appears that it was mainly to provide justification for regarding the housing in Temperance Town as slums in need of clearance. The Corporation’s working definition of slums can be seen in the proceedings of the Housing and Town Planning Committee for 30 November 1933: slums existed where the dwelling houses in an area were by reason of disrepair or sanitary defects unfit for human habitation, or were by reason of their bad arrangement, or the narrowness or bad arrangement of the streets, dangerous or injurious to the health of the inhabitants of the area. 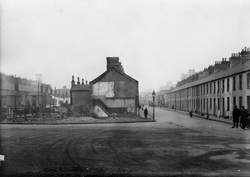 The photographs on this page, taken just before Temperance Town was demolished, have been supplied by Glamorgan Archives.